The client is a leading manufacturer and supplier of aftermarket brake components and systems for everyday cars, work duty vehicles and high performance vehicles under different labels. The client continually innovates significant improvements to break technology for the street and track, having earned four patents along the way. 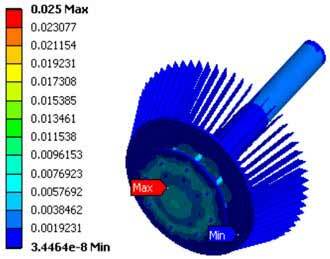 The client contacted Hi-Tech to conduct static structural analysis of a rotor assembly subjected to centripetal force. We knew it was not going to be a difficult task for us but it required total dedication and hard work from our FEA experts. 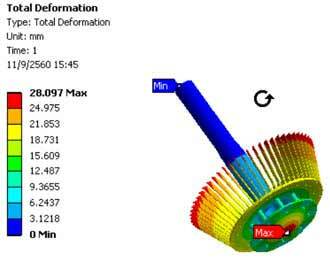 A thorough an analysis of rotor assembly was required to be done which required detailed and thorough FEA of the product. After understanding the requirements of the client; our FEA experts used ANSYS Mechanical software for resolving the problem. A detailed three-dimensional (3-D) finite element (FE) computer model was constructed for Analysis of the rotor assembly. An appropriate FEA element has been used for the 3-D modeling of solid structures. The element is defined by eight nodes having three degrees of freedom at each node: translations in the nodal x, y, and z directions. The volume where the sweep mesh is not possible, an appropriate FEA element has been used. From the analysis results summary, it was concluded that the rotor assembly is subjected to maximum stress at the supporting disk. The strain is out of the elastic region which means there will be a permanent deflection in the disk. Hi-Tech FEA is a division of Hi-Tech iSolutions LLP, a pioneer engineering outsourcing company since 1992 based in India & USA. It provides expert Computer Aided Engineering - CAE consulting services for engineering / product design analysis by modeling & simulation. The primary services extended include Computational Fluid Dynamics (CFD), Finite Element Analysis (FEA), product design optimization and value engineering services to Automotive, Building / Construction, Process industry, Power Generation, Manufacturing & Heavy Engineering industries.